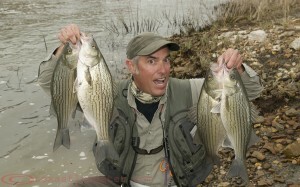 Readership of Texas Fly Caster may be nationwide, and as spring approaches the State you can bet that out-of-state fly fishers are making plans for the Lone Star. In North Texas, last night we had a line of thunder storms pass through along with a typical Texas cool front. The thin red line came with rain, wind and hail, and is currently at the edge of Texas-Louisiana and headed east. 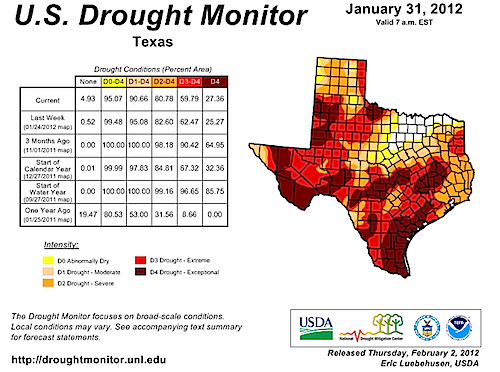 Here in North Texas, and the general geographic area that encompasses DFW (Dallas and Fort Worth), it was announced this week that we had been upgraded out of drought conditions. That comes as a slight surprise, as fishing around lakes like Ray Roberts has been interesting due to dipping lake levels all winter long. New flats and new structures – like old farm house foundations have appeared from nowhere. As severe as that seems for DFW, the water situation here pales in comparison to the rest of Texas. We have had nothing resembling a winter this year in North Texas. Mild temperatures and low precipitation means my Bok Choy has been growing in the garden since November! By comparison, last year DFW was hosting the Super Bowl in the midst of a weeklong weather bout that began with snow, and continued with subfreezing temperatures for about a week – the snow finally disappearing from the shade after about two weeks. The rains as of late, are the kind that go beyond soaking, and are raising local water (Ray Roberts) precipitously. Whenever that happens, the calls go out and come in; “What’s going on at Ray Roberts Dam?” The simple reason being that when the lake gets to the conservation level, they open the spigot. And when the spigot is opened enough, it can bring fish from the next lake, Lewisville Lake, all the way up to the Dam. I say can bring because there are more seasonal variables that go into this PHENOMENON. If the variables all match up, more or less, then fly fishers can have a heyday like the one we saw in 2010. It was one of those PHENOMENAL years in 2010 that lead to catches of hybrids like this (all released alive of course), and even an undocumented ten pound monster (state fly rod record) that went undocumented. So stay tuned, and if it turns on I’ll let you know. 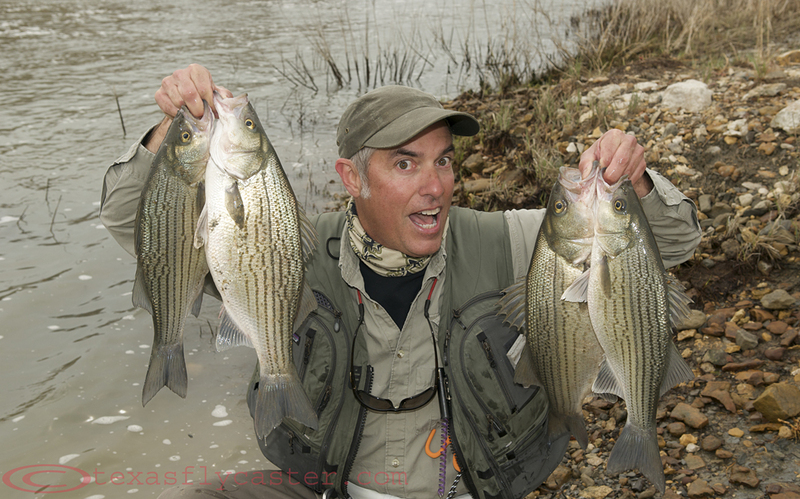 If you are interested in a half-day guided into this PHENOMENON, the Bermuda Triangle of big hybrid bass and sand bass – keep an eye out for more information appearing here first.